fruit. As the authors state, their objective in this book is "to analyze the calculus of the rational individual when he is faced with questions of constitutional choice... We examine the (choice) process extensively only with reference to the problem of decision-making rules." The authors describe their approach as 'economic individualism'. They believe that economists have explored individual choice extensively in the market sector while social scientists have largely ignored the dynamics of individual decision-making in the dynamics of forming group action in the public sector. 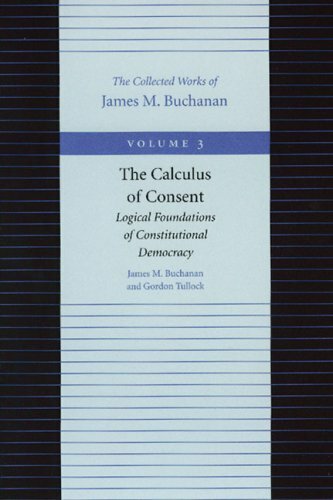 Written in the early 1960s, THE CALCULUS OF CONSENT has become a bulwark of the public choice movement for which James M Buchanan is so justly famous.